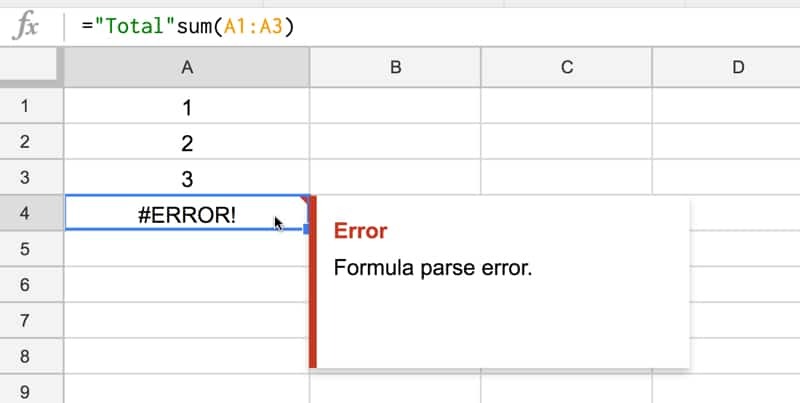 Whether you’re just starting out with Google Sheets or you’re a seasoned pro, sooner or later one of your formulas will give you a formula parse error message rather than the result you want. It can be frustrating, especially if it’s a longer formula where the formula parse error may not be obvious. Match the error message in your Google Sheet to the sections below, and find out what might be causing your error. Here’s a Google Sheet with all these examples in. It’s reasonably rare that you’ll experience this, and it usually points to some fundamental problem with your formula. This will result in the popup error message. It’s easily corrected by removing the unwanted character. Try to avoid these in the first place by checking your formula prior to hitting enter. Make sure you’re not missing a cell reference and you don’t have any unwanted characters lurking. 2. I’m getting an #N/A error message. How do I fix it? 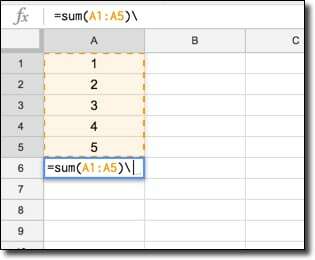 The #N/A formula parse error signifies that a value is not available. It happens most frequently when you’re using a lookup formula (e.g. VLOOKUP) and the search term isn’t found. This is exactly what has happened in the exact match VLOOKUP in the image above. The search term A-051 is not in our data table so the formula returns #N/A. This formula is not wrong or broken, so we don’t want to delete it. However, it would be cool if you could display a custom message, something like “Result not found”, instead of #N/A error message, especially if you have a lot of these errors showing. It gives the spreadsheet user much more information and reduces confusion. How to correct an #N/A error? Instead of showing the #N/A formula parse error when a value is not found, the formula will output our custom message instead “Search term not found”. This formula parse error happens when a number is divided by zero, which can occur when you have a zero or a blank cell reference in the denominator. which has no meaning (because there is no answer, which, when multiplied by 0, would return A). Read more about division by 0 here, although it gets super technical super quickly. Another example is using a formula like AVERAGE with a blank range. So, = AVERAGE(A1:A10) will cause a #DIV/0! error if the range A1:A10 contains no numerical values. How to correct an #DIV/0! error? Well the first thing to do is determine why your denominator is evaluating to zero. In this case, the formula in the denominator SUM(A1:A7) evaluates to 0, which causes the error. So check whether your denominator result is 0. Next, check whether you have linked to blank cells or a blank range in your denominator. Then you can either fill in the blank cell or range, or select a different cell or range for your formula. If your formula is correct and your cell/ranges are not unintentionally blank, then you’ll want to handle the #DIV/0! error. It looks unsightly and makes your spreadsheet look unfinished if you leave these errors floating around. This formula parse error typically occurs when your formula is expecting a certain data type as an input but receives the wrong type, for example trying to do math operations on a text value instead of a numerical value. Spaces in your cells can also cause this error message. In general, Google Sheets do a pretty good job of coercing text into numbers when needed. 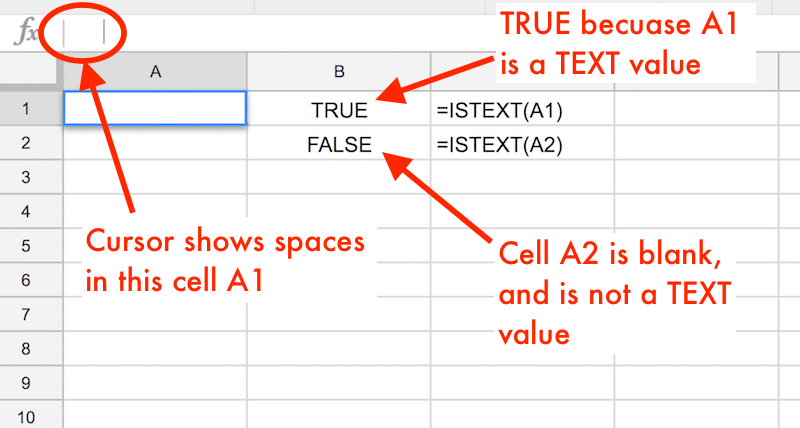 If you enter a value into a cell with some spaces, format it as text and then try to do math on it, Google Sheets will actually force the text into a number and still perform the calculation. Another cause of #VALUE! errors is mixing US and Rest of World date formats. US dates have the form MM/DD/YYYY whilst the Rest of the World goes for DD/MM/YYYY. If you have a mix of the two and try to subtract them to get the number of days between them for example, you’ll get the #VALUE! error. Here the correct answer should have been 59, the number of days between the 28 Feb 2017 and the 31st Dec 2016. How to correct an #VALUE! error? The error message should give you some information on which part of your formula is causing the problem. Search for any possible text/number mismatches, or cells containing errant spaces. If you click into a cell and the flashing cursor has a gap between itself and the element it’s next to, then you’ll have a space there. The #REF! formula parse error occurs when you have an invalid reference. 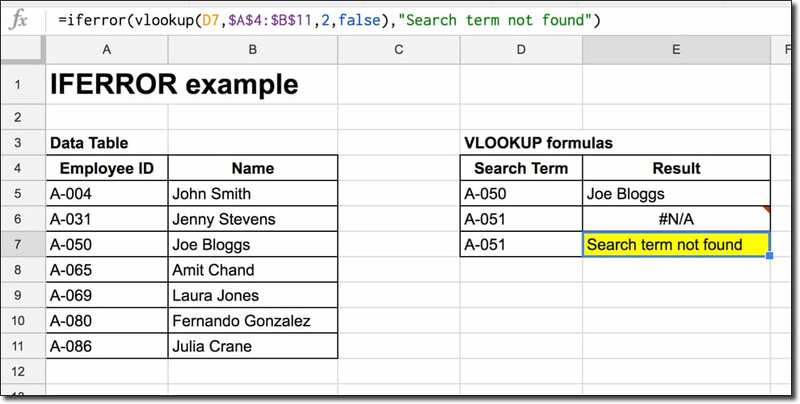 Missing reference: For example when you reference a cell in your formula that has since been deleted (not the value inside the cell, but the whole cell has been deleted, typically when you’ve deleted a row or column in your worksheet). Another way that a formula can refer to missing references is when you copy a formula with a relative range at the edge of your sheet. When you copy and paste, it’s possible the relative range moves as if it were outside the bounds of the sheet, which is not allowed and will cause a #REF! error. Circular dependency: You’ll also get a #REF! error when a circular dependency is detected (when the formula refers to itself). In this example, I have numbers in the range A1 to A3, but the SUM formula in cell A4 tries to sum from A1 to A4, which includes itself. Hence, we have a circular argument where cell A4 is trying to be both an input and output cell, which is not allowed. How to correct an #REF! error? First of all, read the error message to determine what kind of #REF! error you’re dealing with. This should give you a big hint on how to correct the error. For deleted references, look for the #REF! error is inside your formula, and replace the #REF! with the correct reference to a cell or range. For out-of-bound lookup errors, look through your formula carefully and check your range sizes against any row or column indexes you’re using. For circular dependencies, find the reference that’s causing the problem (i.e. where you refer to the current cell inside your formula too) and modify it. The #NAME? formula parse error signifies a problem with your formula syntax. The most common reason for this error is a misspelling in one of your function names. Another reason for a #NAME? error is referencing a named range which doesn’t actually exist, or is misspelt. How to correct an #NAME? error? Check your function names are correct. Use the function helper wizard to reduce the chances of errors happening, especially for the functions with longer names. As you start typing your formula, you’ll see a menu of functions, which you can select with the up and down arrows and Tab. Check you have defined all named ranges before using them in your formulas and that they all have the correct spellings. Check any text values are entered with the required quotation marks. Lastly, have you missed the colon in your range references? It’ll be obvious because it won’t be highlighted correctly. is missing the colon between A1 and A10 and will throw a #NAME? error. The #NUM! formula parse error is shown when your formula contains numeric values that aren’t valid. Some other functions that can result in #NUM! error messages are the SMALL and LARGE functions. If you try to find the smallest n-th value in your dataset, where n is outside the count of values in your dataset, you’ll get a #NUM! error. How to correct a #NUM! error? You need to check the numeric arguments in your formula. The error message should give you some hints about which part of the formula is causing the issue. 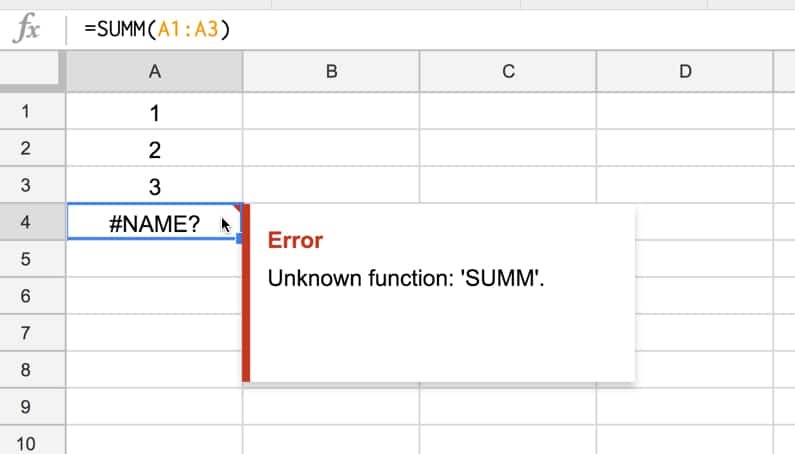 This formula parse error message is unique to Google Sheets and doesn’t have a direct equivalent in Excel. It means that Google Sheets can’t understand the formula you’ve entered, because it can’t parse the formula to execute it. How to correct an #ERROR! error? Carefully check your formula for accuracy. You want to ensure you’ve got the correct number of brackets and correct join syntax between text and numerical values (e.g. using “&”). When you want to show values with currency symbols or as percentages, don’t manually type in the “$” or the “%”. Instead enter a plain number and then use the formatting options to change it to the style you want. I haven’t been able to recreate a #NULL! formula parse error in the wild but theoretically, it exists! 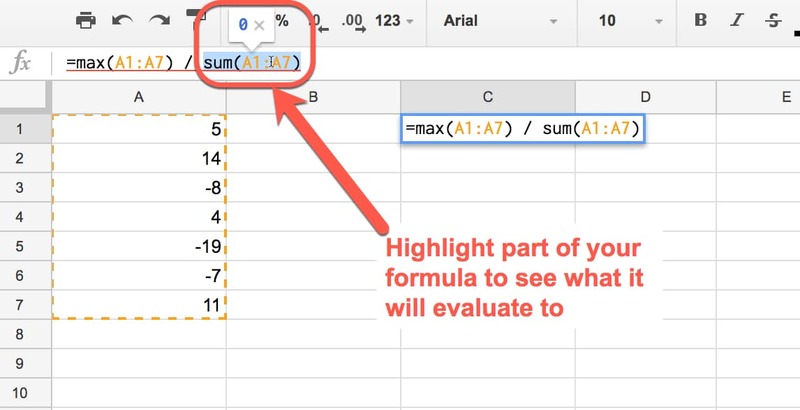 Look for red highlighting in your formula as this will help identify the source of your error e.g. in the case of too many brackets, the extra, superfluous ones will be highlighted in red. Peeling back the onion: this is a technique to debug errors for long, complex formulas. Unwrap the outer functions in your formula one-by-one, until you get it working again. Then you can start to add them back one-by-one again, and see exactly which step is causing the issue and fix that. Different syntax in different countries: Some European countries will use semi-colons “;” in place of commas “,” so this could be a cause of your error. Compare these two formula, which have identical inputs and outputs, but the syntax is different for users in different countries (locales). Use apostrophe at the start of a formula to turn it into a text string, which won’t execute. This is sometimes useful for seeing your whole formula for debugging, keeping a copy of your formula so you can copy and paste bits of it elsewhere for testing. There are a few other functions related to formula parse errors that are worth knowing about. In fact, there is even a function to generate #N/A errors. It’s of limited use, but can be helpful for doing data validation in more complex formulas. Take a deep breath, don’t panic! There’s an army of Google Sheets super users out there who would love to help you fix your issue, free of charge, in the active help forums. Try posting your problem into the forum and someone will likely help you out. To make it easier for people to help you, please share your Google Sheet (either view-only or create a redacted copy if sharing is a concern), what error message you’re getting and what you were expecting the correct answer to be. Where can I find information on the types of formula’s that will work in Google Sheets in the Data —›Filter—›Filter by condition… —›Custom formula is area? I have much data that I need to filter by three columns in order to update it on a weekly basis. One field is a serialized number field (consisting of section#.meeting#.item#) of which I need to filter by meeting# only, another is a text field with a specified date in it with a format of “[mm/dd/yy]” and the third field is a data validated list. This Google sheet has a header that references data from another sheet in the same workbook and the values that I need to filter by are returned in the header dropdown (VLookup) and shown on specific cell. Ideally, I would love to have the Custom Formula reference the values in these cells for the filter, but I am willing to enter them manually if I have to. I need this Custom formula because I need to filter my data by the meeting# in the number field OR the specified date in the text field AND by the data validate list so that I can edit and append it. I have another sheet that does a query of the data from this sheet with these parameters very well, but I cannot edit the data there. My specific challenge is how I can do an ArrayFormula in the Custom Filter field that mimics what I have done with the query() on my reporting sheet so that I can edit my data? Good question! I don’t know of any specific resource for the formulas you can use inside of the filter. They need to start with an “=” sign, and you create a formula for the first row of your data, and let the filter apply that test to all the other rows, e.g. if your data was in A2:D100 say, with index numbers in column 1, and you wanted just odd numbers to remain, you could use a formula like “=isodd(A2)”. Hope that helps! Feel free to share your sheet or a copy with dummy data if you want to delve further. Generally the formulas are not as comprehensive as what you can do in the general Google Sheet. Is there a way to force a file to produce an error in Google Sheets….when the source is an Excel file? 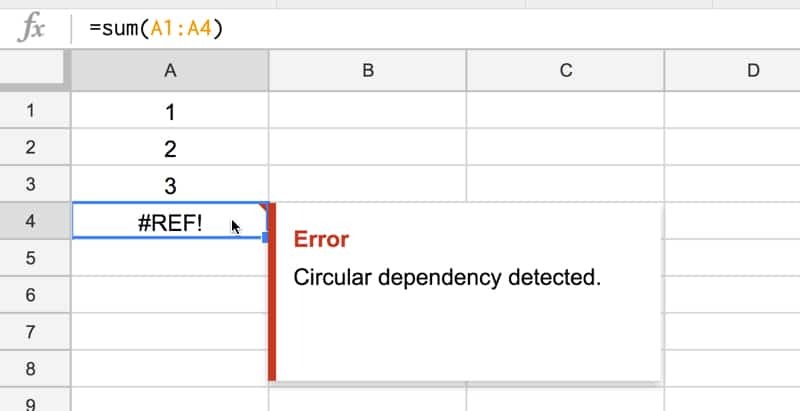 I’m wondering the case of someone taking my Excel file, uploading to Google Sheets – what I would love is for it to produce error messages all over the place to warn them that they can’t use in Google Sheets (needs to remain in Excel). Any advice? Thanks! Hi, great article – thanks! I am having the issue with the closing brackets on my formula. Everytime I press enter, it adds quotation marks and a close bracket even though I have already put those in. Thus it doubles it up and produces an #ERROR! message. Any ideas? Hi Jen – sounds like you’re using Excel? The info on this page applies to Google Sheets only. That being said, if you’re in the same spreadsheet you should have no trouble linking to a different tab within that spreadsheet. Just try clicking to the cell rather than typing in the cell reference. Hi Ben – I am following both your courses ‘advanced formulas’ and ‘apps script’. Love it! From zero to pretty cool sheets in a week or two :-). all other columns add all the numbers correctly. Once I started double checking the addition I tried adding a column before the D which made the original C a D the new D column adds all the numbers. Very strange I realize we should always check our numbers but thought someone might have the same issue or might not realize and go by the SUM answer and be incorrect.